Experience technology, outstanding craftsmanship and exquisite decor for today's lifestyles. Since 1987, our clients have been the most important part of our business. Everyone here at K.W. 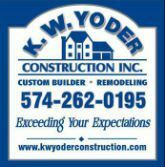 Yoder Construction Inc. understands this, and that it is an honor to be a part of building such beautiful homes and renovations. We hope you enjoy them as much as we have building them.